After visiting the LFS a couple of weeks ago I decided to try putting an octopus in my refugium. I’d researched this option in the past but decided to wait until the time was right. Well… a generically labeled “Common Brown Octopus” made its way by accident into one of the LFS’s order. When the octopus arrived at the store it was about 12 inches tip-to-tip and appeared to have an injury to its mantle. Dan, the LFS owner, didn’t have a place to put the octopus nor did he think it was going to live because of the injury it had sustained. 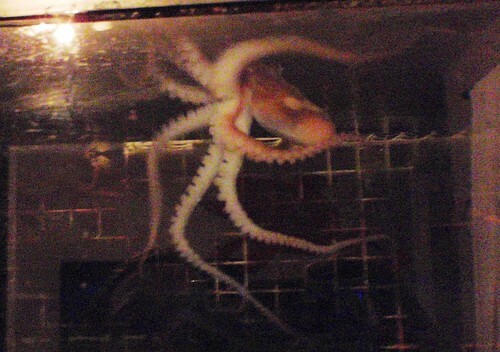 So… I put the octopus into an in-tank refugium placed inside of my 90 gallon refugium. 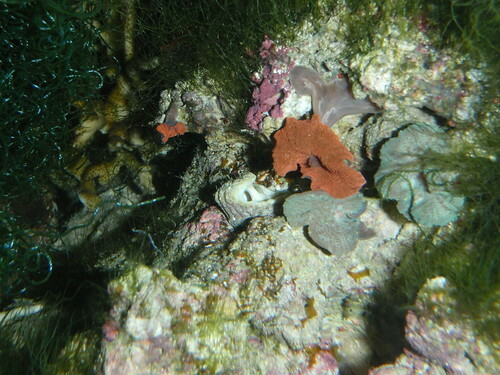 After placing the octopus in the in-tank refugium he hid in the rocks for a few hours then right before bed time he slipped over the top of his tank and into the main refugium. I was speechless. Over the next couple of hours he appeared to be very lively, searching every nook and cranny in the tank. I guess his injury may have occurred before he was collected. The place of the injury has left two white areas where he is not able to change color anymore. The octopus has now been in the refugium for a couple of weeks and has took up residence in a hole in a rock in the middle of the tank. 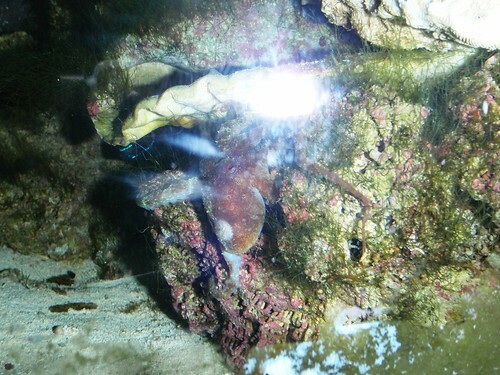 He uses an Astrea shell as a door to his cave (4th picture below). I’ve been feeding him chunks of frozen shrimp from tweezers about every other night. At first he was more interested in taking the tweezers from me but now he realizes they bring food and he goes for the shrimp instead. I’m curious to see how long he will get along with his tank mates (peacock mantis shrimp and 3″ damsel). The octopus has been pretty shy lately so I removed “her” door and saw her with a large clutch of eggs. From what I understand, this means that she’s not going to live too much longer after the eggs reach full-term. From what I’ve read, it could take between 2 and 10 months for the eggs to hatch. It will be interesting to see what happens! 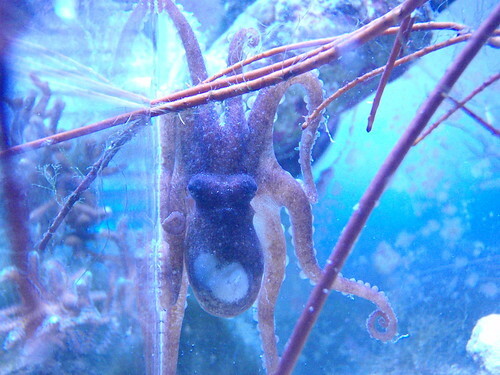 Posted on March 19, 2011, in Saltwater Aquarium Reef Tank and tagged Brown Octopus, Common Octopus, fish tank, Injured Octopus, Octopus, Octopus Aquarium, Reef, reef tank, Saltwater Aquarium, saltwater tank. Bookmark the permalink. Comments Off on Octopus in the refugium.